"...This is an excellent program. I'm so glad that I stumbled on to this when researching for task management programs. Very low learning curv, quite flexible, and the price is right. Tried at least 20 other programs, either too complicated, too expensive, or poor documentation..."
Order 750 checklists in MS Word and PDF printable format at $49.99 USD only. BUY NOW! Make an action plan. The process of restroom cleaning will be efficient if you initially make a plan of actions and procedures. It is similar to task management: you create to-do lists and specify tasks required for good cleaning. By using task management software you develop an action plan that includes such key tasks as Scheduling, Equipment, Supplies and People. Let’s view these tasks in detail. Develop a schedule. First of all you need to find out how much time you have in your disposal to clean up the restroom area. For example, you have 5 hours. Then you need to develop a schedule with the overall duration of 5 hours and also specify durations for each cleaning procedure. Use task management software (e.g. VIP Task Manager) to make your schedule and set up durations. Involve people in the cleaning process if needed. If you need assistance in cleaning the restroom area you can ask somebody (a family member, friend) or employ a professional cleaner who will help you manage procedures. But remember in case somebody helps you this person should know your guidelines in order to do the job as you expect. Before use, always read a product label and carefully follow the safety directions it gives. Never use any chemicals improperly! Make sure each cleaning product you purchase has a safety data sheet, a serial number on the label and customer service contacts. Be very careful when using corrosive chemicals because acids or caustics can damage your skin and leave scars in seconds. Always wear special protective goggle during the process. Some poisonous chemicals (glycol ether or ethanolamine) can quickly absorb through your skin so you should always wear special gloves to protect your hands. Be sure that during procedures the work area is well ventilated. Carefully rinse out buckets after each use. Looking for multi-user task management software? 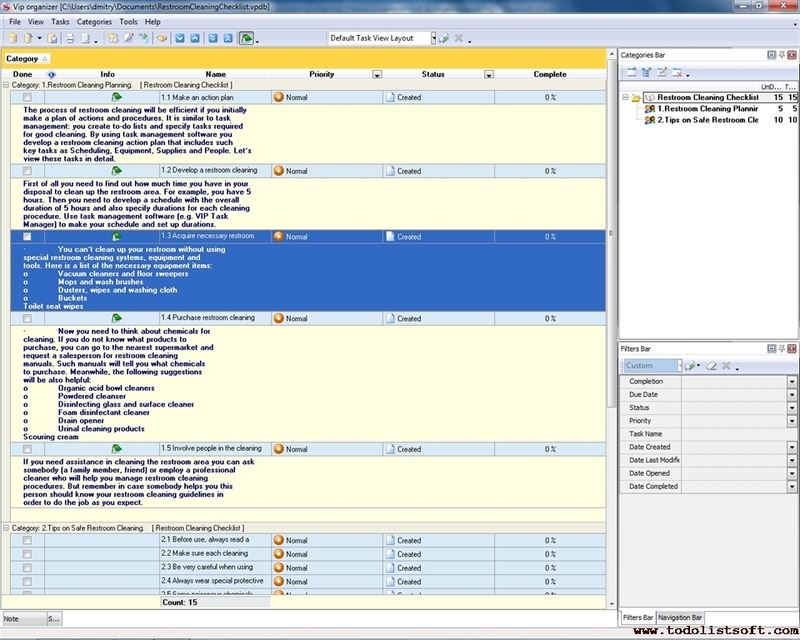 Try CentriQS complete task management solution for planning, tracking and reporting tasks, projects, and schedules. Increase productivity of your small business or office by better organizing your employees' tasks and time. to plan, schedule and track project tasks. to plan daily chores, trips, wedding, etc.